Anyone who cooks in a kitchen, whether it is a professional kitchen or where you make dinner at home, knows that having good knives is the key to preparing any food in a speedy manner. If you use a dull knife to cut something, you could end up cutting yourself. If you use a serrated knife to chop up carrots, the same results could occur. To make sure that you have a variety of knives available to use in your arsenal of kitchen tools, you can purchase a knife block set that has everything that you need. Being a home chef can limit your knowledge when it comes to what knives are best in certain situations, so take a look at our rundown of knives and decide what is important to have in your knife block. We have comprised a list of some of the best knife blocks that are available for purchase as well as an option that if a bit more budget friendly than the rest. for your consideration. When it comes to knives, you want to purchase them from a company that is known for making durable cutlery, and Zwilling J.A. Henckels has been manufacturing premium cutlery since 1731. Going strong for almost 300 years should count for some trust in the quality of their products. Their Twin Signature 19-piece knife set shows the love and dedication that is forged into every blade. Starting with the block itself, it is designed from beautiful bamboo, which is sure to look amazing in any kitchen. It is 16.2 inches long, seven inches wide, and 17 inches tall, which means that it can easily fit under most upper cabinetry without any issues. When all of the knives are placed in the block, the unit only weighs about ten pounds, which means that it is also easy to shift on the counter top if need be. The knives in this set are designed to feature an ergonomic grip that is easy to use. In addition, the stylish black handles sports three rivets on the surface to secure the blade. The blade is stamped instead of being forged to keep the model a lightweight option that most will have no issues using in the kitchen. The blades are high carbon stainless steel, which is a great option for a knife in this price range. Each blade was hand honed to perfection. The Friodur ice hardened blades give strength to the design of the knife as well as a lasting sharpness to the blade’s edge. This knife block set comes with 19 pieces, which does include the block itself. There is also a peeling knife that has a two and a half inch blade and a paring knife that sports a four inch blade. There are two utility knives that have non-serrated blades; one sports a four and a half inch blade and one has a six inch blade. Another utility knife is included that features a five inch blade, but this one has a serrated edge. When it comes to larger knives, you will find an eight inch chef’s knife, a seven inch Santoku hollow edge, and an eight inch serrated bread knife. There are also nine non-serrated steak knives included in this set. In addition to the knives we just listed, there is also a pair of kitchen shears as well as a nine inch sharpening steel that is included in this set. All of the knives are considered dishwasher safe, but like with all fine cutlery, they will be better maintained if you take the time to wash them by hand. This set is designed to last a lifetime, so it only makes sense that the manufacturer would include a lifetime guarantee with the purchase of the set. Our silver pick, which is a classic seven piece slim knife set, is manufactured by Wustof. The company is a family owned business that is located in Solingen, Germany, and they have been making high quality cutlery since the company began in 1814. The knife block has six slots to hold each of the seven included pieces. It features a small, compact design that only leaves a 9.5 inch long by 3.5 inch wide footprint. It only weighs 6.8 pounds, so it can easily be moved to fit anywhere in your kitchen. The kitchen block is available in a few different color options as well, which include black, cherry, natural, acacia, bamboo, and walnut. These options ensure that you can choose a style that fits the existing wood that may be in your kitchen. These knives are designed to be lightweight balanced cutlery that is easy to use. The blades are forged from a single piece of high carbon stainless steel, so they will remain sturdy for years to come. The handle is then placed on top of the blade in two sections that are riveted together in three separate locations. The handle s made from a durable polyoxymethylene, which is a synthetic material that conforms to a tight molecular structure. This feature makes the handle more resistant to fading and discoloration over the years. The blades on this knife set are high carbon stainless steel, which makes it a stain resistant blade. Each blade is honed with a technology that is called PEtec, which enhances the sharpness of each blade by about 20 percent, and it keeps them sharp for up to two times longer. Each blade is buffed and polished by hand to bring out the beauty of the knife. Since this knife block set only has seven pieces, a few of the knives found in our gold pick are not seen in this one. You will find a three and a half inch paring knife and a five inch utility knife. Insofar as larger blades, there is an eight inch chef’s knife included in this set as well as an eight inch bread knife that has a serrated blade. An eight inch Kiritsuke or sharpening steel is includes in the packaging as well as a pair of kitchen shears that are designed to easily come apart to be cleaned. Since this set is designed to last through years of kitchen cutting needs, the manufacturer has kindly included a lifetime warranty to make sure that your blades remain sharp, balanced, and in perfect condition. Our bronze pick is a contemporary fusion knife block that is manufactured from Chicago Cutlery. Around the world, they are a well known company when it comes to cutlery and this selection does not disappoint. It is an 18 piece knife block set that is adored by consumers and critics alike. Starting with the block itself, you will notice the detail on the block is simply stunning. It is a unit that is 9.6 inches long, 8.4 inches wide, and 14.8 inches tall. It stands a bit taller than some of the other options on our list, but it is still capable of fitting underneath a top cabinet without any issues. In addition, the block only weighs 13 pounds, so it will be easy to set up and move on your counter top when needed. The block is made from pine wood that has been stained with a honey colored gloss that really brings out the details in the wood. It also comes complete with stainless steel accents to finish the look. 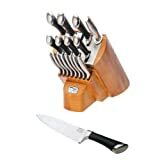 The knives in this set are made from a high carbon stainless steel material, which is designed to be extremely durable. It is actually a metal that is rust and corrosion resistant, so you will not have to worry about that aspect of maintenance. The handles are designed in a sleek black color that is fitted with poly grip handles. This grip ensures that the knife does not slip while you are cutting with it. It also adds a great bit of comfort for those times when you will be cutting up vegetables to feed a crowd. The hilt of the knife is fitted with a stainless steel plate, which gives the end of the knife a very contemporary feel. This 18 piece set comes with an eight inch slicer. It also comes with a seven and three fourths inch bread knife as well as a chef’s knife with the same blade measurements. A seven inch Sanatoku and a five inch Paroku are also a part of this package. Since they are unique knives that you may not see in other sets, you will have a unique style of chopping knife that can be versatile in a kitchen. This set also includes a five inch utility knife, a three and a quarter inch long paring knife, and a three inch peeler. In addition, this set comes with eight steak knives that have blades that are four and a quarter inches in length. You will also receive a sharpening steel to keep your blades from going dull. It is recommended that you only wash these knives by hand, they may be fine in the dishwasher, but why risk your cutlery when wiping the blades clean is a simple task. 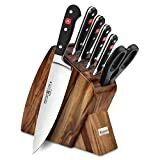 In addition, since these knives are designed to be durable for decades, the manufacturer has included a lifetime warranty with the purchase of the set. Everyone cooks, especially those of us who are ballin’ on a budget, so you will need a knife block set option that does not cost hundreds of dollars. The main sacrifice that you will make when you need to purchase a cheaper set of knives is the fact that the blades will most likely be stainless steel instead of a high carbon stainless steel, which is a sacrifice that most of us can live with. 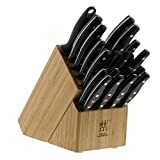 Our last pick is the AmazonBasics Premium knife block set. The base of the unit is a wooden block that is 14.6 inches long, 7.7 inches wide, and 6 inches tall, so that means that it will be easily able to fit under any cabinet. It is weighted to provide extra balance and control in the kitchen. In addition, the handle features a triple rivet to maintain a sturdy connection to the blade. This set comes with eight steak knives that are four and a half inches long; each of which has a micro-serrated blade that reduces the need to be sharpened. It also comes with a six inch boning knife and a five and a half inch utility knife. As far as longer knives are concerned, this set comes with an eight inch chef’s knife, an eight inch slicing knife, and an eight inch serrated bread knife. A pair of kitchen shears is also included in this set. • Paring Knife – This knife is designed for trimming, cutting, and dicing small food like potatoes. It has a plain blade edge, so it can be a great tool for creating radish garnishes of other intricate food preparation. • Utility Knife – A utility knife is the perfect sized knife to quickly grab and use for a range of food preparation purposes. Since this knife can be so versatile, it is often a favorite among chefs. • Chef’s Knife – A chef’s knife is a larger knife than the previous we that we listed. It is a commonly used knife for dicing, chopping, and mincing. It has a curved blade that allows you to cut through food with precision on every cut. • Bread Knife – A bread knife has a long serrated blade that is designed to saw through bread and cakes without smashing or crushing the item in the process. It is also a great knife to use when you need to cut through a tomato. • Carving Knife – A carving knife is a long knife that is designed to slice through meats. It has a thin blade, and thus, it can produce thin slices of meat that are perfect for a sandwich. • Boning Knife– A boning knife is simply a knife that is designed to remove the bones for your meat products, especially the small bones that can be found in chicken and fish. • Steak Knife – A steak knife is a table knife that is used to cut through portions of meat that are on your plate. It can have a plain edge or a serrated one, but they can both be effective. • Filleting Knife – As you may have guessed, this knife is designed to fillet fish in a precise manor. The material that your blade is made from is important, as it will determine how long the blade will last and how much sharpening and care they will need over the years. The best material for a knife blade is ceramic. It can be sharpened similarly to what you would find on a scalpel, and it will not need to be sharpened again for a long period of time. A ceramic blade is fragile and expensive, so it is not seen in many homes. A carbon steel based blade also will have a great edge, but it will also be susceptible to rusting easily. A stainless steel blade is a cheap option that can be used, but the blade does tend to diminish its sharpness rather quickly. A good middle ground when it comes to a knife blade is a high carbon stainless steel option, which has the good qualities of both a stainless steel blade and a carbon one. If you can purchase a knife set that has forged blades, you will find that they will be much stronger than stamped ones. You will want your knives to have solid handles that will not bend or break under pressure. Some common choices are strong wood, hard plastic, or even hardened resin. The handle needs to be functional, but also serve a stylistic desire as well, so choose a handle that will also look good with your kitchen décor. Most knife block sets have a block that is made from wood. Other materials are an option, but a rustic block of cherry or walnut will look great in almost every kitchen. The type of material that the wood block is made from is a decision that is more of a stylistic choice, rather than one that is crucial to how well the knives perform, but some wood blocks do have internal knife sharpeners that automatically sharpen the blade when it is removed from its home. This is a great feature to make sure that your blades are never dull. Some knife block sets have more obscure items that you may want to have in your kitchen. One of these items is a cleaver, which is a large knife that is designed to chop large cuts of meat. A pair of kitchen shears could also be included in certain sets, so decide whether you need them in your kitchen as well. Also, make sure that the knife block set you select has a way to sharpen the blades of the knives. All knives need sharpened at some point, so it is important to either have a sharpener in the block itself, a knife honing stone, or a sharpening steel. Having lightweight knives is important for being able to chop ingredients quickly, but you may also want a heavier option for chopping hard ingredients like nuts. A good knife will have an even weight distribution between the handle and the blade. A good way to test the balance of your knife is to balance the hilt of the blade on your finger. A solidly designed knife will not fall from your finger. Maintaining a good knife set requires you to know the blade. You must know when it needs sharpened, as a dull knife is more likely to cause an injury than a sharp one. You must know to check the hilt of the knives to ensure that it is well jointed. A knife that has a gap between the blade and the handle is a breeding ground for bacteria as well as the perfect location for the blade to snap in two. You must also know that even though some knives are dishwasher safe, it is always best to wash sharp knives by hand to prevent rusting and blade damage. A good knife block set with a plethora of knives to work with can be a costly purchase, but it can also be a great choice to make. Check the warranty on the set you are thinking of buying, if it comes with a lifetime warranty, spending a few hundred dollars on a beautiful set that can be passed on to your children should definitely be considered. If there is not a lifetime warranty, how much are you willing to spend on a set that you may need to replace? Now that you know the difference between the different types of knives that are available to you, you realize that there is a need and a use for all of them. Consider which knives are the most important to have in your kitchen and then decide which features you need in a knife block set. Maybe you want a built – in ability to sharpen the knives as they become dull, or maybe you would sooner have a life time warranty in case the blades become nicked or damaged. Whatever your requirements are, do some research to find a knife block set that fits your needs. You’ll be chopping fruits and vegetables like a professional sous chef in no time at all.